That's what Realtor Doug Miller did with one of his listings in Lancaster Township, Pa. 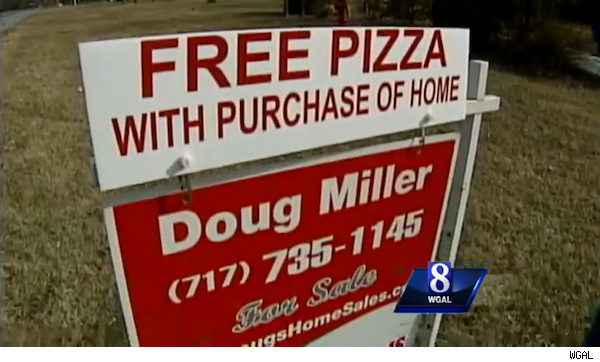 He put up a sign that says "free pizza with purchase of home" outside the house, Pennsylvania TV station WGAL reported. That's good for a chuckle, but also good for buyer traffic to the home, Miller said. "Anybody who buys this, I will get them a pizza," Miller said, reiterating the quirky offer. Hey, if the way to a man's heart is through his stomach, perhaps that's the way to his pocketbook, too! Miller's listing has been languishing on the market for six months, but it remains to be seen whether his new tactic will close the deal. It's not the first time that a Realtor has used a humorous play for business. Last summer, Canadian Realtor Jake Palmer put up signs in front of one of his listed homes saying "not haunted," "fog resistant" and "love shack, baby," among other quips. But do these tactics actually get homes sold? It's hard to say. Of course, there are more tried-and-true ways to sell it fast, such as staging your home, choosing certain paint colors -- or just pricing it right.